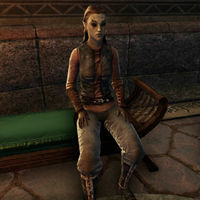 Kylia Thando is a Dunmer who can be found in Saint Delyn Plaza in Vivec City. She has requested help with the Matus-Akin Egg Mine, and has a repeatable quest to clear that location. "Do you work with Traylan? Could you please tell him to look over my request again. The problems in that egg mine simply must be addressed!" "Oh dear, I do hope you've come about my request. It would be awful if those kwama spread across Vvardenfell!" I'm here for more information about the Matus-Akin Egg Mine. "Those poor kwama. I would never have the heart to cull them myself, but it must be done for the greater good. I know the Temple has asked you to bring me research notes and an egg sample. Can you tell me more about this breed of kwama? "They've been bred to be highly aggressive, so much so that they're nearly impossible to control. They're calmed by a specific pheromone, though I'm afraid I don't know which one. That's why they appear to tolerate most of the Rumblegarde inside." Is there a queen kwama in this mine? "Oh, poor queenie. She's likely on her deathbed at this point, having been made to be productive far longer than is acceptable. I believe she's been put in some chamber we can't reach, connected to the mine through some smaller kwama dug tunnels." What are you going to do with the egg and research? "Though the methods to produce these kwama are far from sound, the end goal is still noble. These kwama may lead us to hardier, more disease resistant breeds. With ethical research practices I believe I can help produce a viable solution." "It's very important I get that research to further my studies. I hope you've come to tell me of your success." I've done what you requested. "Oh, this is a nice, strong specimen you've selected for me. Isn't it adorable! And you have the notes too, excellent! I'll begin my research at once. You've done a huge favor not only for me, but or all kwama kind. Thank you." "I'm sure you're concerned about the kwama egg, but be rest assured that I'm handling it with the greatest of care. You'll be the first to know when the little one hatches! Oh, I am trying not to get too attached you know."